Just a quick update, as I am still feeling pretty crampy from the events of today’s office visit, and would like to remove this laptop from my pelvic region as soon as possible. So, the hysteroscopy went well. Dr. F and her colleagues didn’t find anything of concern while they were poking around in my business. The video was cool to watch, and was a welcome distraction from the discomfort I was feeling with a camera up in my hoo-ha. She also did an AFC (antral follicle count) and checked to make sure fluid was flowing between my tubes and uterus properly. My AFC was slightly high, as is the norm with PCOS patients, but Dr. F said that the follicles she counted looked to be healthy sizes, for whatever that’s worth. Everything today looked normal, as per usual. 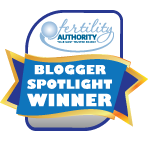 Dr. F said as she was leaving that she has great faith that we can do this thing without IVF, and that all signs point toward a very healthy reproductive system that just can’t get its business together. She aims to help me with that, and I feel good about my chances. In other news, I had my full thyroid panel drawn today, including thyroid antibodies, which I’ve wondered about for some time. I’ll be interested to hear those results in a few days when they come back. I also had my Vitamin B-12 levels checked. I’ve been reading a lot lately about B-12 deficiency and its effects on the body. I have many of the symptoms of B-12 deficiency, but those could be attributed to other issues as well, so I will just wait on the results to find out my next step, if there is one. I’ve decided to move forward with Metformin. Not today, but soon. I have the prescription waiting for me at the pharmacy, but I want to get my B-12 results first. I have read that taking Metformin can actually cause B-12 deficiency, and I want to gauge my levels before I start taking the drug. I know my acupuncturist won’t be thrilled with me taking the Met, but I know she will accept that I’m doing what I feel is best based on doctor recommendations. I also ordered a month’s worth of Pregnitude. For those of you who have never heard of this product, Pregnitude is a powdered supplement of Folic Acid and Myo-inositol, both of which are essential B vitamins that your body needs. This particular combination is a high dose, and many women with PCOS have found that it has helped regulate their hormone levels when used with (and without) Metformin. I figure I might as well give it a shot. I’ve also eased up on my self-placed dietary restrictions. I am allowing myself gluten again, but being sure to only consume whole grains if possible. I’m still avoiding processed foods, and having sugars only in extreme moderation, and mainly from fruit or honey. I’m trying to keep with a low-glycemic index diet as much as I can, and I feel that the regulations help me to make better choices all around. I received my blood work results from my PCP this morning, and they came back with a slightly low glucose level (72) and a very slightly elevated VLDL level (which is a triglyceride, apparently), so I am seeing more clearly that while I may not be insulin resistant, I am sensitive to the peaks and valleys of my blood sugar. I was told not to be terribly concerned about the VLDL as it was just a bit high, but it’s one more thing pointing toward pre-diabetic tendencies, insulin issues, and PCOS. So that’s what’s up in my neighborhood. Pieces are falling into place, little by little. For now, I’m going to sit with my feet up and relax till my acupuncture appointment in a couple of hours, and then I’m going to make myself a dinner high in protein and low in carbs, and watch Hell’s Kitchen till I fall asleep.